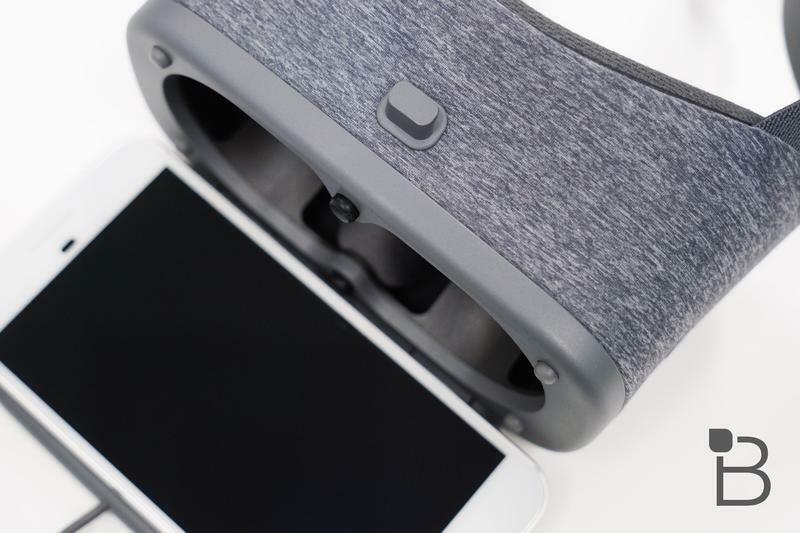 Google's Daydream View VR headset is now available for purchase in the United States. 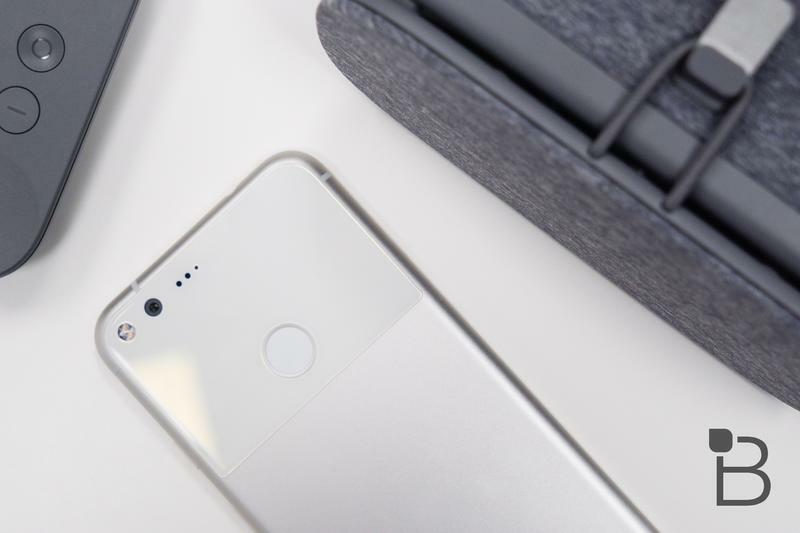 It only works with the Pixel and Pixel XL right now, but other phone makers have promised updates to their handsets that should enable support soon. 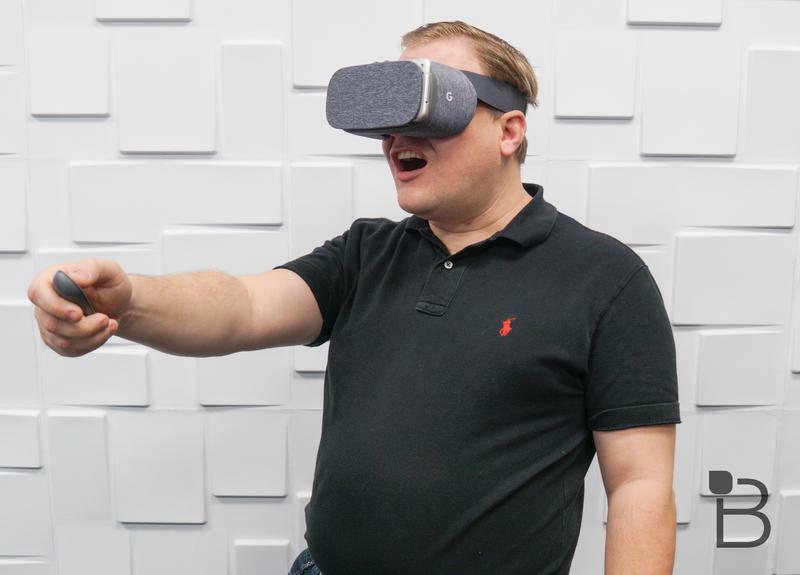 I've been playing around with the Daydream View in our offices for a bit, and I'm ready to serve up my platter of opinion. 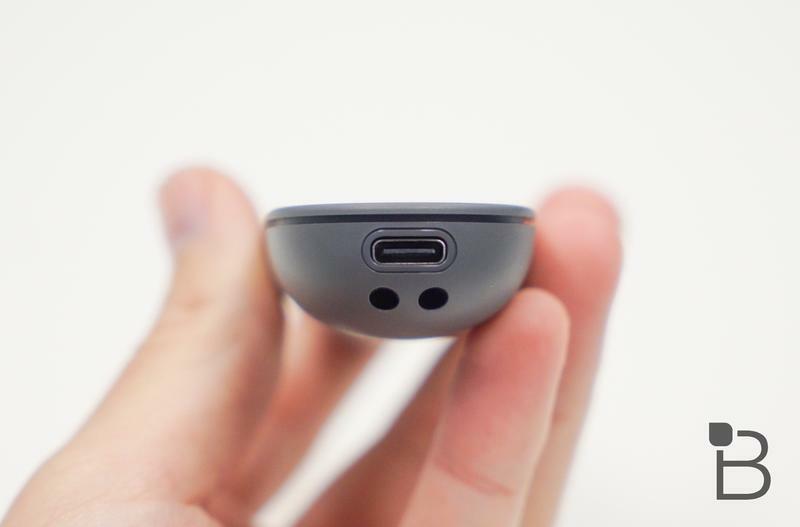 I think there's huge potential for the headset, but there's also a lack of content and a bit too much obscurity about what additional smartphones are going to support it. Let's discuss. I can't shake the thought, for some reason the Google Daydream View reminds me of a wool sock wrapped around Google Cardboard. It's silly, and this isn't at all what the product actually is. 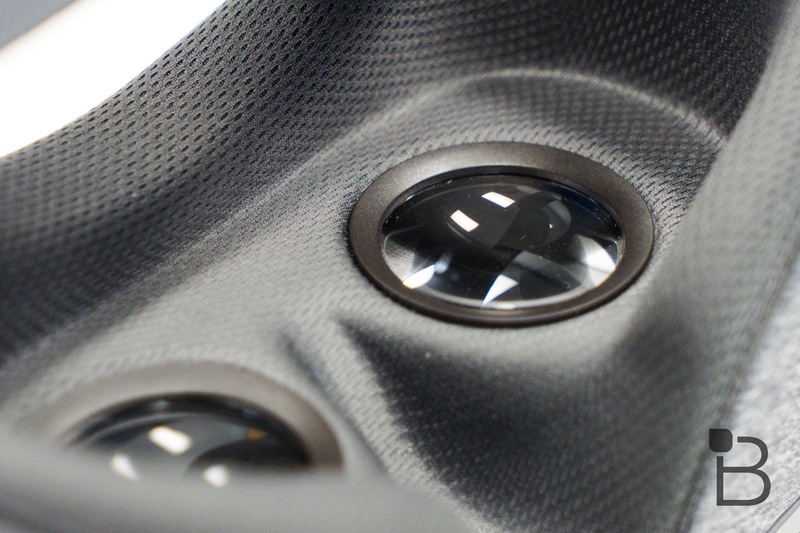 In fact, the cloth wrapping makes it very comfortable to wear, more so than Samsung's Gear VR headset. 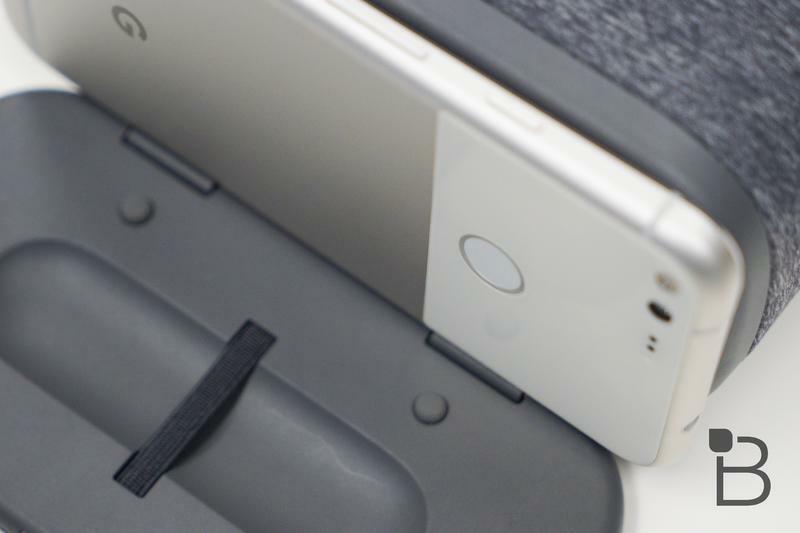 The product is very simple, another feature in its cap against the Gear VR. You don't need to plug your Pixel or Pixel XL into the device at all, just rest it on a small platform and fold it up into the viewer. You secure it with an elastic strap. That's it. There are no cables, no charging, nothing. NFC takes care of everything in the background and will automatically launch into the Daydream VR application. My only gripe is that there were times, about a half dozen or so during my time with the unit, where the app didn't launch appropriately. After removing the phone and replacing it, the problem was solved. The headset is comfortable to wear, relying solely on a strap that wraps around your head. 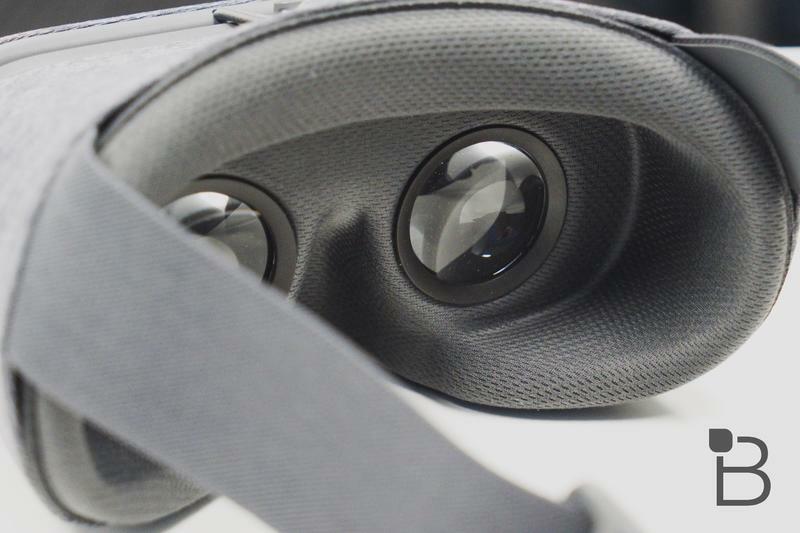 There's a soft-padded nose cavern that adds to the comfort, and I like that the cloth makes the whole product feel less bulky and cumbersome than the Gear VR. That comes at a cost, however. 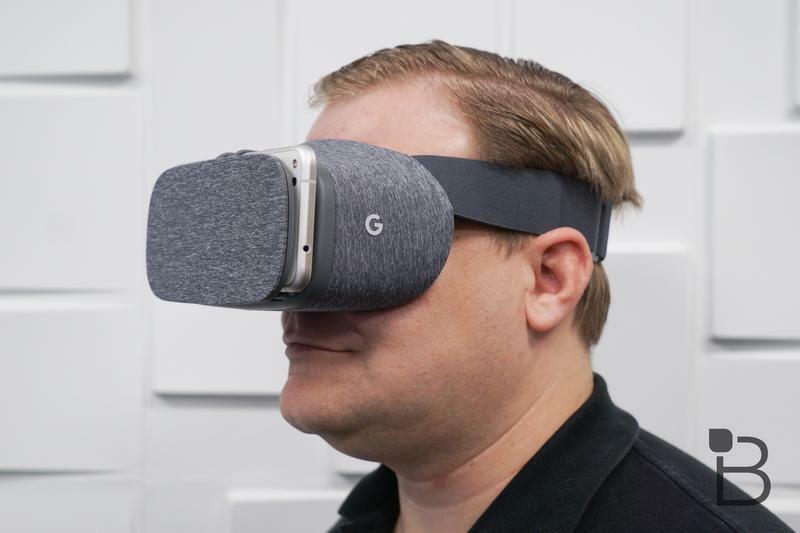 While the Daydream View may feel less bulky, I think it's also less immersive than Gear VR. When you place the headset on, you can still see some of the your surroundings, a problem perhaps related to light reflecting off of either the smartphone or the glass lenses. This isn't an issue if you're sitting in a dark room, but it was when I was sitting at the desk under incandescent office lights. Tightening the headset helped a bit, but didn't solve the problem. Google has a quick 2 minute guide that walks you through how to use the controller, including instructions on what the various buttons are for. It's convenient, since the controller is a key component in the whole experience. 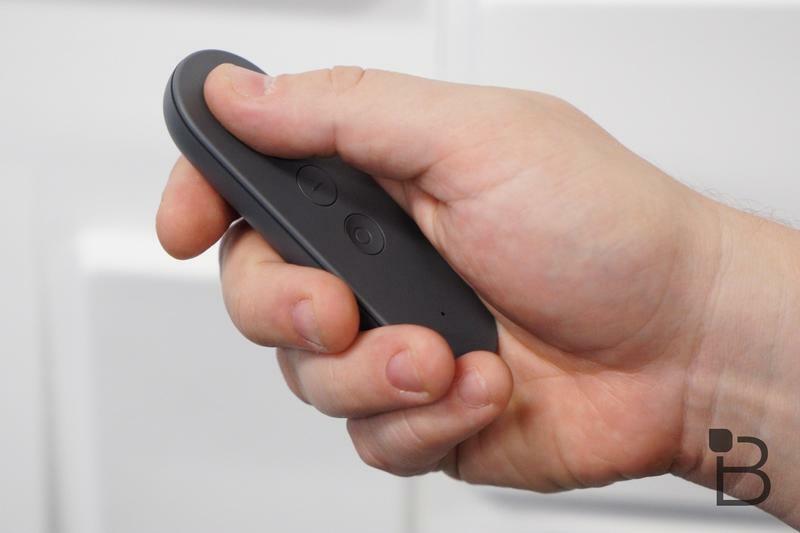 Think of it as a VR Wii mote. You can use it to select various menu items with a small cursor, complete with a virtual "laser" that tracks right back to the controller in your hand. It's a brilliant way to interact with content. In fact, I much prefer this method than sticking to a touchpad on the side of the headset or buying a controller, as is the case with the Gear VR. Better yet? When you're not using it, it stows neatly inside the headset. You can use the controller to move back to the home screen by holding the lower circular button down. 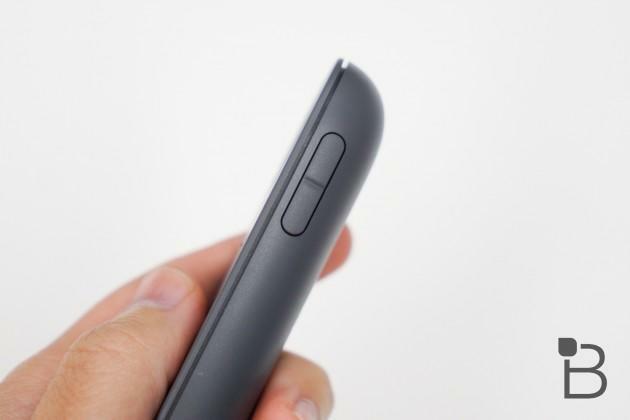 It can also be used to re-center you when needed, and there's a small touchpad up top that can be used for easily moving through menu items. It works really well. I still don't know how long the battery lasts, but it has a microUSB charging port on the bottom for when it inevitably dies. The virtual experience is pretty familiar, too. You're basically standing in a forest with a selection of apps floating in front of you. It looks almost like what one sees in the Gear VR, save for you're in a virtual house in that headset. From here, you can select a variety of apps, like Google Street View, a special WSJ VR application, several games, Google Photos, 360-degree YouTube videos and Google Play Movies. I know the system is new, so it's going to take time, but there's a disappointing amount of content right now. Sure, you can take a digital tour of a museum or watch a movie with Google Play Movies. Or maybe you'll view some of the 360-degree photos that are stored in Google Photos. These are all great experiences, and the level of detail seems to be right around what I found in the Gear VR. With the lower-res and smaller Pixel, you just don't get as much viewing space. There just isn't much to do once you're in VR on the Daydream. Gear VR, on the other hand, has a massive selection of games and experiences. It also allows you to access locally stored media, like movies and photos that aren't up in the cloud. I wish Google allowed the same, and I suspect it will soon. Google is going to build on its experience, though. We know that a new partnership with the NFL will bring us on the sidelines and behind the scenes of NFL teams this season, for example. 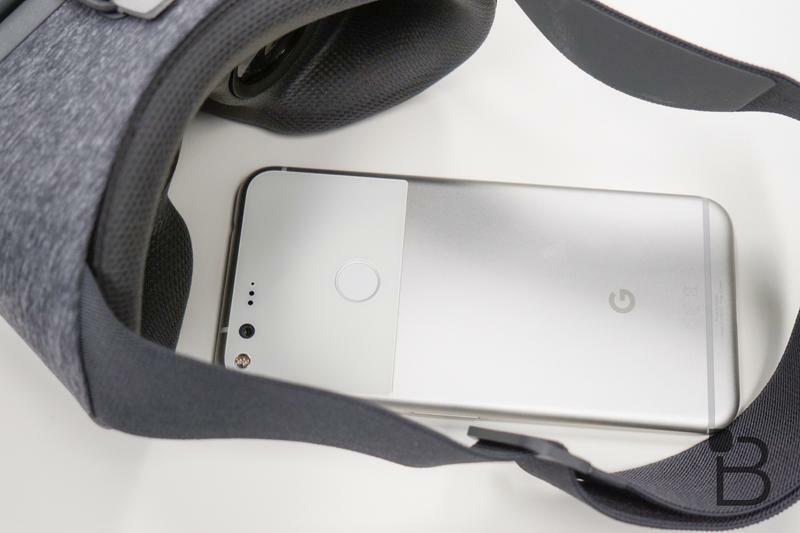 Developers will no doubt quickly expand the offering of games available, so long as Google sticks behind this as the defacto VR platform for Android. I'm curious if Google will tie in its other products and services, too. Will I be able to view my email, load a website in Chrome or see a text message? You can use a browser in Gear VR and it also provides notifications from your phone, though you can't interact with them. I appreciate having those functions, and hope Google considers adding them as options in the future. I also don't like the sense that I'm standing in a forest looking for content. Google should offer different starting worlds, including maybe just a simple living room. Watching a movie in Google Play Movies, for example, puts you outside in a backyard theater. Why not just a regular theater, as is the case on Gear VR? While those situations — being outdoors — makes things feel a bit magical, they also take away from the immersion aspect of VR. 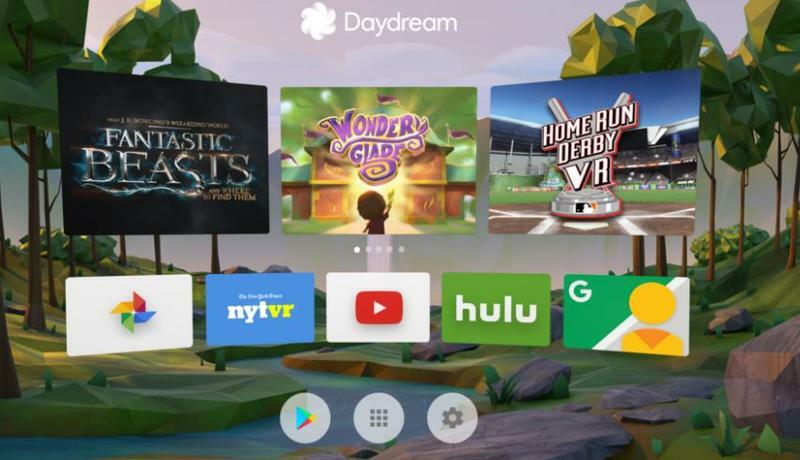 Finally, while companies such as ASUS and ZTE have already launched "Daydream ready" smartphones, they don't actually work with Daydream View just yet. Perhaps they will after a future update. That means there are just two phones that work with the system right now, the Pixel and Pixel XL. I suspect many more are on the way, but that also means developers don't have a huge incentive to make great apps yet. Millions of people use Samsung Galaxy devices and can buy Gear VR. 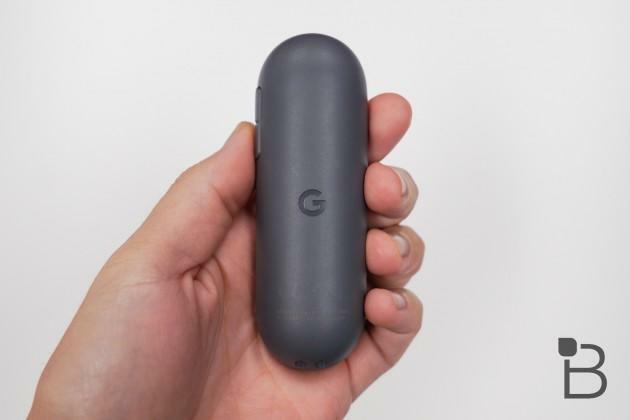 It will take a while for there to be as many people with Daydream-ready phones, and so I can see why developers may not make it a priority. Despite all of this, I think the Daydream View is a solid buy rating. In fact, after spending time with our in-office unit, I went ahead and ordered my own from Best Buy for $79. That's a fair price to pay, even if there isn't a whole ton of content. 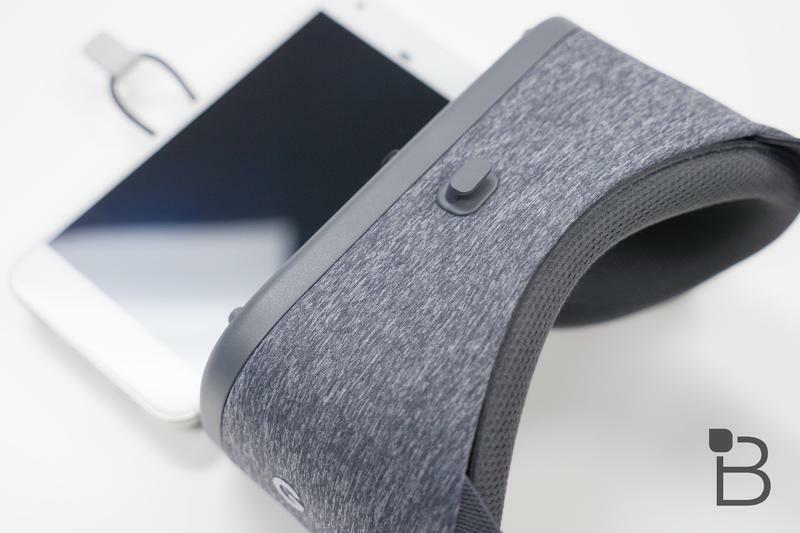 I think we're just beginning to see what these mobile virtual reality headsets are capable of doing, and I look forward to using my own headset to follow along as new apps and experiences are introduced. The headset is comfortable, the controller is great and the whole experience is dead-simple to use. You really can't go wrong. 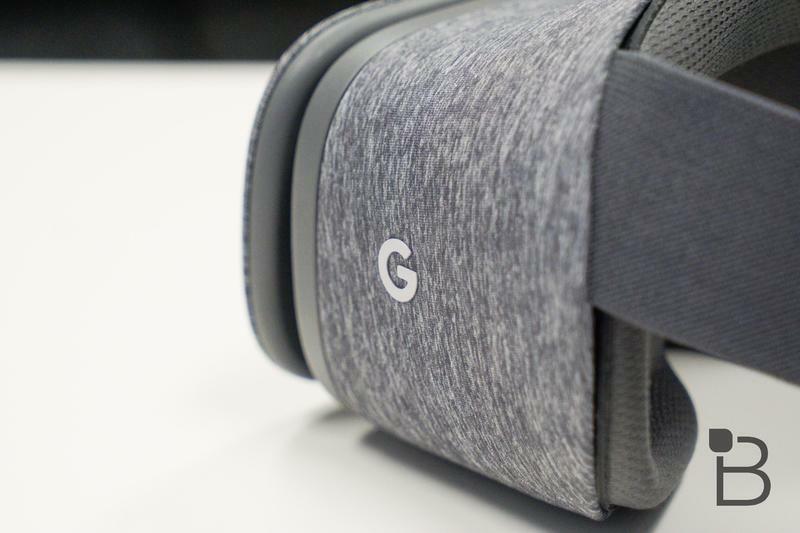 Disclaimer: Google provided us with a review unit of the Daydream View headset. 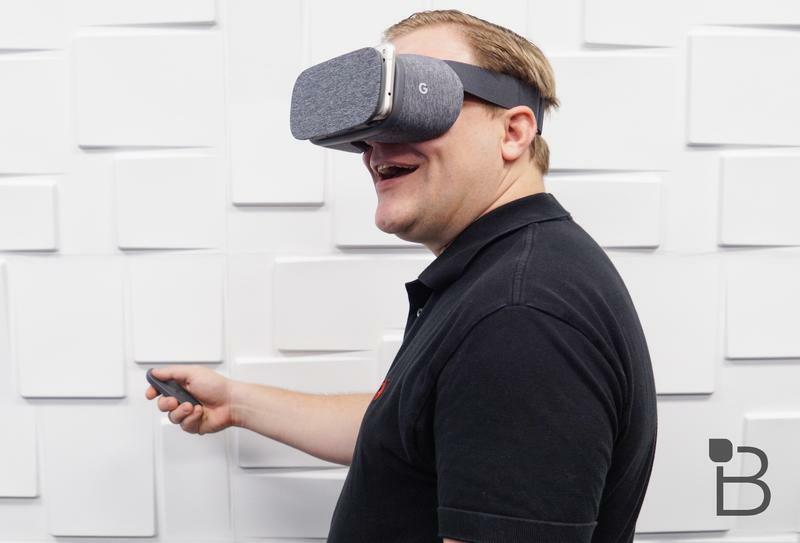 Todd purchased his own Daydream View after testing.